During his sabbatical last spring, Ryan Emanuel, associate professor in the Department of Forestry and Environmental Resources, began working on an environmental history of the Lumbee Native American community. It was the next step in a journey that had begun two years prior, when he began researching water and Lumbee culture. As he researched for an invited talk at an ethnohistory conference last fall, he worked closely with people in the Lumbee community who were concerned about environmental issues. He kept hearing about the proposed Atlantic Coast Pipeline, a natural gas pipeline that would span eight North Carolina counties as it ran south from Virginia. Around the same time as the protests against the Dakota Access Pipeline at Standing Rock last fall, Emanuel traveled to Capitol Hill to give a briefing on water research. Seeing the parallels between the review and permit processes between the two pipelines, Emanuel began to examine the larger picture of indigenous water issues happening across the country. After he completed the briefing, things started to converge. He reached out to state tribal leaders about possible impacts and concerns and asked how he could help. He saw that the community had concerns that the pipeline would be harmful and unfair but were not able to quantify the issues in a way that would garner a response from officials. With his skills, tools and resources as a scientist, he found two key ways to help: first, he looked at the environmental justice review and found an incorrect mathematical analysis. He also found a procedural mistake in that the tribes were not consulted in the review process as recommended by federal policy. In doing this work, Emanuel describes himself as a “bridge” between two entities, a role he understands well. Emanuel’s roots are deep in Lumbee culture. He considers Robeson County his home although his parents moved to Charlotte when he was young. He has extended family in Robeson County, a day trip away from Charlotte. Early on, he understood “bridging” between two communities. With a B.S. in geology from Duke University, and an M.S. and Ph.D. in environmental sciences from University of Virginia, Emanuel has worked in the areas of ecohydrology, watershed hydrology, watershed biogeochemistry, secondary ecosystem succession, land-atmosphere interaction and coastal science. He has taught a long-running course in watershed hydrology to both graduate students and undergraduates. Now in his eighth year at NC State, his depth and dedication to the field was recognized with a University Faculty Scholar designation in 2016. Emanuel has begun building another bridge, this one between his scientific work and his more recent interdisciplinary work in social science. He will teach teach a new course in the College of Natural Resources titled “Indigenous Peoples and the Twenty-First Century Environment,” which looks at case studies about environmental issues Native Americans face in the U.S., involving topics such as water, pipelines and salmon farming in the northwestern U.S. He gave a talk at UNC-Chapel Hill last week on his paper, “Flawed Environment Justice Analyses,” which appeared in the journal Science in July 2017. However, Emanuel is not new to social justice and giving back. From his upbringing, he has always felt he had a responsibility to take care of the earth and water for future generations and to value education. He has assisted with NC State’s Native Education Forum, a program that brings high school juniors and seniors to campus for a six-day residential experience, and has also worked with recruitment and retention efforts in Multicultural Student Affairs. Emanuel agrees that there is much work to be done to achieve a more representative Native American community of faculty, staff and students at NC State. “We need a critical mass of faculty and staff, that is the number one issue,” he says. “Students want faculty that share their life experiences.” Yet he agrees that it is a challenge to uproot Native people from their communities to come here, as he learned while working with Judy Kertesz and other NC State colleagues to propose a new faculty excellence cluster in areas of indigenous knowledge. Instead, he suggests it is helpful to view the UNC system as a whole when assessing the richness of the Native community, to strengthen cross-campus collaboration. He cites Malinda Maynor Lowery, associate professor of history at UNC-Chapel Hill and director of the Southern Oral History Program, as an example of someone who is a resource to the entire region. He would also like to see more courses offered as part of the Native American Studies minor, to ensure that the program is well-supported for students pursuing that option and for all students interested in the field. Strong support of the minor provides a recruiting tool for prospective students as well. Emanuel adds that NC State has strengths that should be recognized; for example, according to recent statistics from the institutional research offices at NC State and peer institutions, NC State has the third largest Native student population in its group of peer institutions. And, he praises the strength of NC State’s Native students in terms of their leadership and involvement in organizations such as NASA, AISES and in Greek life, initiating, organizing and executing major campus events such as Indigenous Peoples’ Day, Native American Heritage Month and the annual NC State Pow Wow, one of the larger events of its kind in the area. 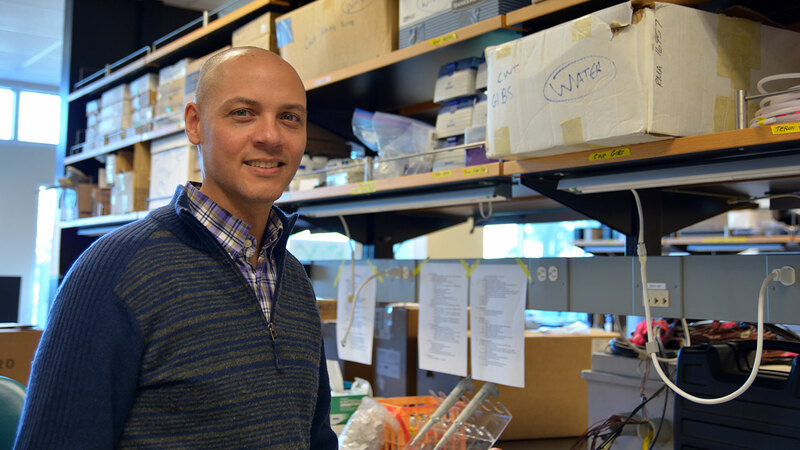 Personally, Emanuel enjoys helping students by providing research experiences within his lab and serving as a mentor. He advises students not to be afraid to talk to their professors and to build a network, even if it takes them out of their comfort zone. Especially for those who don’t come from families of scientists or academics, he is happy to help serve as their bridge to a successful future.